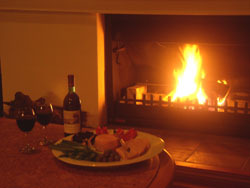 Garden Spa Suite - 1 night with a romantic three course candlelit dinner for two. King bedroom, double spa bathroom, private lounge room, wood fire and kitchenette. This dinner package Includes a three course romantic candlelit dinner for two, menu provided on arrival. Full country breakfast is included. King bedroom, double spa bathroom, private lounge room, wood fire and kitchenette. This dinner package Includes a three course romantic candlelit dinner for two on one of the nights, (menu provided on arrival). Full country breakfast is included. Single person stay with king bedroom, spa bathroom and private lounge room with TV DVD and tea and coffee making. Includes two course evening meal and full country breakfast included. Tennis Court Spa Suite - 2 night. 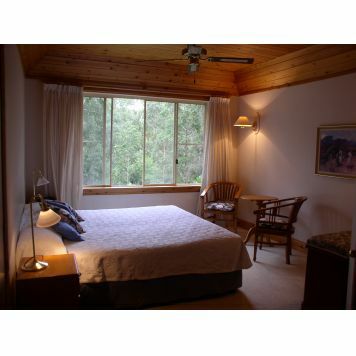 King bedroom, double spa bathroom, private lounge with wood fire kitchenette and verandah. 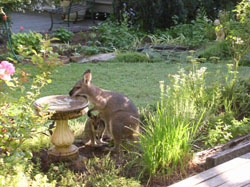 Includes a three course a romantic candlelit dinner for two, (on one of the nights) in your suite or on the verandah. From best quality fresh ingredients. Menu provided on arrival. Full country breakfasts included. 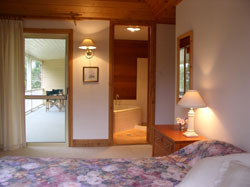 Special, three night rate, includes King Bedroom, spa bathroom, private lounge and full country breakfast each day. Wireless internet access. Small meeting facilities available. Private parking on site. Drive down to Kemeys, plenty of parking in parking area. Traveling from Sydney, take the F3 (National 1) freeway from Wahroonga, heading north towards Newcastle. After about 50 minutes take the Morisset, Cooranbong, Mandalong Rd exit and turn left (West) into Mandalong Rd. Then after 1km turn right into Deaves Rd (sign says to Cooranbong) & after only 100metres, turn left into Sauls Road. 4.1km up Sauls road on the right side you will see the number 410 & a silver 44 gallon drum with the Kemeys sign on the gate set back from the road. The gate may appear to be locked but it is very unlikely. Enter (please close the gate) and drive down to Kemeys. Travelling from north, take the F3 (National 1) freeway heading south towards Sydney. Take the Morisset, Mandalong exit & turn right (West) into Mandalong Rd. Then after about 1km turn right into Deaves Rd (sign says to Cooranbong) & after only 100metres, turn left into Sauls road. 4.1km up Sauls road (100m gravel) on the right side you will see the number 410 & on the right side you will see a silver 44gallon drum with the Kemeys sign. The gate may appear to be locked but it is very unlikely. Enter (please close the gate) and drive down to Kemeys. 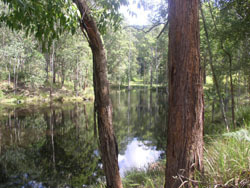 Kemeys is at Mandalong, 10kms west of Morisset and is nestled in the foothills of the vast Watagan Mountains with its many walks, lookouts & picnic areas. It is also centrally located to explore the whole scenic area of Lake Macquarie, the Hunter valley, vineyards, rugged coastal beaches & historic Newcastle. 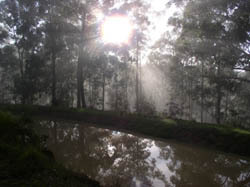 Birding, mountain biking, horse riding, 4 wheel driving and bush walking. Jett Buzz speedboat sightseeing, sailing, kayaking, canoeing, fishing and walking paths along the foreshore. From the rugged beaches in the Munmorah State Recreation Area in the south, to historic Catherine Hill Bay, Caves beach with the low tide caves, the Newcastle beaches and Stockton beach in the north. Hundreds of pubs, clubs and restaurants, towns and villages including Charlestown, Glendale & Kotara for shopping malls, Belmont, Swansea, Warners Bay, Toronto & Wangi Wangi on the foreshore. Cooranbong and Avondale with the South Seas Museum and The Elephant shop. Morisset and the massive Mega Market. Historic Martinsville and Wollombi in the west. MASSAGE This can be Swedish, Aromatherapy, Remedial & therapeutic, Chinese acupressure and Most forms of beauty treatment.